Returning from a tough road trip and with significant line adjustments, the Nashville Predators bested the Washington Capitals with relative ease. Highlights were provided by Viktor Arvidsson, who scores when he wants, as well as his linemates. Defensively, the revamped pairings looked stronger than ever. Let’s take a look at a detailed, analytical breakdown. Keep in mind, all of these stats are from five-on-five (no special teams) unless otherwise noted. Although Ryan Johansen was still getting it done by himself, the Nashville Predators have benefited immensely from the emergence of “JoFA” from the IR list. The Predators tend to have a bit of a depth scoring issue, so they rely on this trio often. Fortunately, it’s one of the best lines in the NHL. Washington threw some of the best they had at Johansen & Co., and were still trounced. As far as single-game performances go, this is the most dominant I’ve seen a Nashville line all season. Typically sheltered, this group actually took the majority of their faceoffs in the defensive zone. Keep in mind, this is only including five-on-five minutes. Producing a +11 CF and +5 HDCF in just over eight minutes, all while facing stiff competition, is mind blowing. Forsberg, Johansen, and Arvidsson were on a completely different level. The Predators’ second forward line was considerably different than recent memory provides. Kyle Turris is still (I’m assuming) weeks from returning. Peter Laviolette has tried many, many different combinations in his absence. Last night, it was Colton Sissons, Nick Bonino, and Austin Watson. Personally, I think that combination is a disaster waiting to happen. Each of these players, individually, have produced heavily negative differentials in shot attempts and scoring chances this season. *DISCLAIMER* I am well aware that Nick Bonino scored two goals last night. I am also well aware that his first goal was assisted by Sissons and Watson. That said, here I’m only interested in how they affected five-on-five possession. For a moment, if possible, let’s forget about goals. To be honest, I’m torn between B- and C+. One the one hand, this line faced Washington’s top three (Ovechkin, Backstrom, and Wilson) more than any other Nashville line. Also, they held that group to just one high-danger scoring chance. Unfortunately, they also produced just a single high-danger scoring chance and were beaten in shot attempts, in spite of a heavily offense-weighted usage. Also, Watson challenged Tom Wilson to a scrap after a clean hit, which never fails to induce eye-rolling from me. I expected a lot from Nashville’s third line, consisting of Kevin Fiala, Calle Jarnkrok, and Craig Smith. Fiala and Smith create offense with ease, and Calle Jarnkrok is the quintessential two-way depth forward. With the top two lines eating the tough minutes, this group’s path was paved with gold. Sadly, they chose to hike through the thorn bushes instead. Even with a slightly offensive deployment and relatively easy matchup, this line produced little-to-no offense. Creating just four shot attempts, while allowing nine, is far from ideal for a line of this caliber. Additionally, they failed to produce a single high-danger scoring chance. In terms of possession, this group struggled. Finally, the curious fourth line. Freddie Gaudreau and Rocco Grimaldi typically aren’t a consistent possession force, but I would expect the addition of Ryan Hartman to boost the line’s performance. Hartman has been a puzzling storyline this year – he’s critically underutilized, as far as I’m concerned. All that said, how did they fit in to the 7-2 victory? Basically, they took an easy assignment and ran with it. Not only did they face Washington’s weakest line, they also avoided taking a single faceoff in the defensive zone. They did well to produce a large advantage in shot attempts, and edged out their competition in high-danger chances as well. To put it plainly: it worked. The big storyline going into this game was the reorganization of the defensive pairs. Instead of the standard arrangement, Josi and Subban were paired together, as well as Ekholm and Ellis. I was skeptical of this move, to be honest. Subban and Ekholm usually face the toughest minutes, allowing Josi’s offensive abilities to shine. Still, the Predators have been very leaky on defense this year, so making adjustments is understandable. I don’t truthfully remember the last time Nashville’s top four lived up to its expectations. I think this can be attributed to a couple of things. Subban enjoyed being deployed away from an opponent’s top line – he had more opportunities to move up ice and control possession. Mattias Ekholm is playing as well as any NHL defenseman right now, and made up for Ellis’ recent struggles. Hamhuis and Weber, in my opinion, is Nashville’s best current option for the third defensive pairing. They received a bad grade last night because of their comparatively easy matchup and getting outplayed in shot attempts and scoring chances. Still, I think this arrangement of the defensive corps should be continued unless significant issues arise. Overall, it was a decent night for Nashville defensively. Washington produced eleven high-danger scoring chances (the same number as Nashville) at five-on-five, which is a few more than I’d like to see. Juuse Saros made some excellent saves early, while the score was still close, to provide the foundation for an offensive onslaught. Juuse Saros has had an interesting season. His first several performances were well below his usual standard. Since then, though, he seems to have returned to the “wow” level once more. Washington was able to produce several high-quality chances, including a couple that hit the post. Aside from a power play goal and garbage time consolation prize, Saros had the crease locked down. Washington’s only five-on-five goal came from a high-danger scoring chance. Allowing one such goal per game is more than excusable, and even expected. Nashville benefited from excellent goaltending once again, but their offense at least provided scoring support to help out. If I were in charge, I would give Saros another start this week. 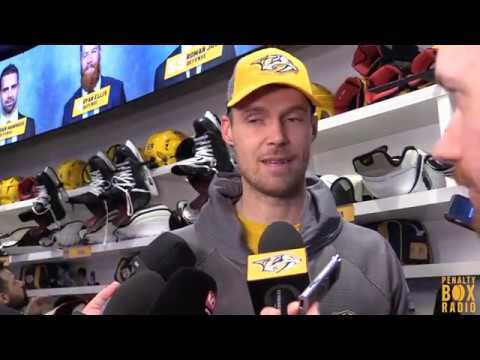 He’s proven that he can perform at an elite level once more, and Pekka Rinne will certainly benefit from the time off. As always, if you have any questions about these report cards or any other analytics concerns, please feel free to reach out to me on Twitter (@WadeM117) or @PenaltyBoxRadio. Also be sure to check out PBR’s weekly analytics podcast: Between the Fangs.